Scenic Applecross in the Scottish Highlands provides a pleasant excursion featuring dramatic mountain scenery, gentle loch-side views and relaxing nature walks. Leave daily stresses behind as we travel to the Applecross Peninsula, one of the remotest areas in Scotland. Enjoy a relaxing day of natural beauty and wonderful panoramas. 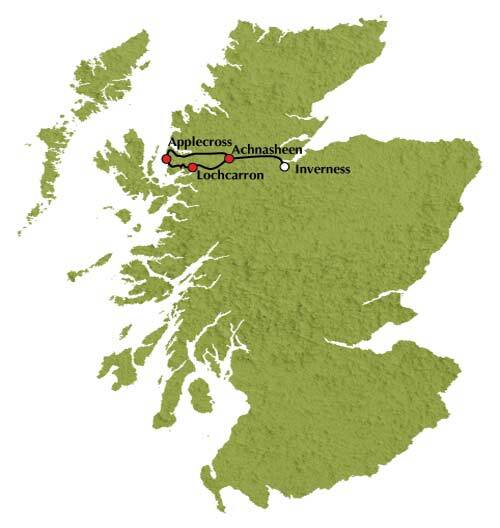 Our journey begins with a drive across the Black Isle to Garve and the village of Achnasheen and on to our first stop in the pleasant village of Lochcarron next to the loch of its name. We continue to Ardarroch, where there are views over Loch Kishorn to the mountains on the opposite shore. you to take in the panoramic views to Raasay and the Isle of Skye (on a clear day) before starting our descent to Applecross Village. We spend some time in Applecross, so you can enjoy the spectacular seascapes or visit the local heritage centre to find out about the Highland Clearances. This is an area rich in wildlife, so nature lovers should keep an eye out for otters, red deer, and pine marten (one of the rarest of British mammals). We leave Applecross and follow the banks of Loch Torridon to Shieldaig for a further stop. We next travel through the Beinn Eighe National Nature Reserve to Kinlochewe and then retrace our outward journey from Achnasheen to Inverness. Pass, Applecross, Loch Torridon, Beinn Eighe Nature Reserve and Achnasheen.